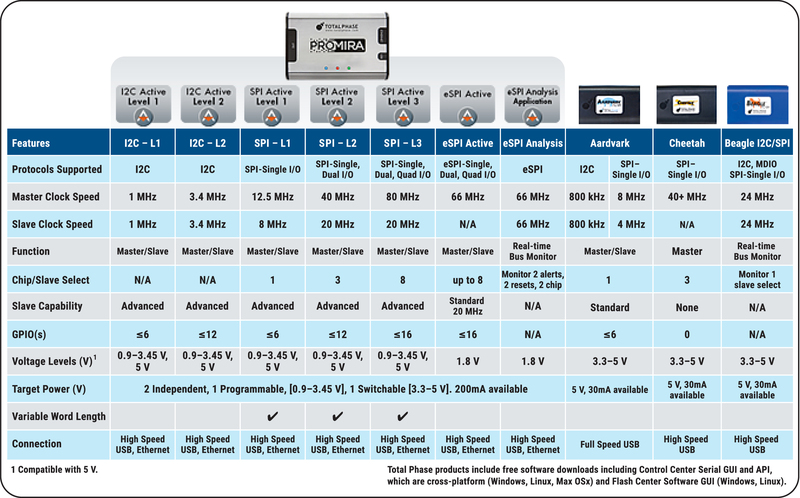 The all-new architecture of the SPI Active - Level 3 Application running on the Promira Serial Platform provides superior performance. With many new embedded features such as integrated voltage level-shifting, advanced message queuing, High-speed USB or Ethernet connectivity to your analysis PC and many more, debugging or programming your SPI system has never been easier or faster. Once you're running the SPI Active - Level 3 Application on your Promira platform you can create your own interface using Total Phase's robust API or select from our no charge GUIs: Control Center Serial or Flash Center to control your SPI data. The purchase of your SPI Active - Level 3 Application includes one year of support, allowing you to download any updates for this application for 12 months after purchase. † Actual system bus speed may vary as a function of load and line length. 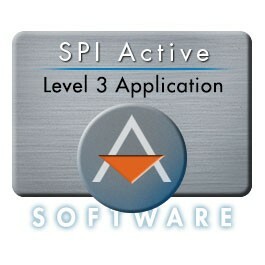 The SPI Active - Level 3 Application is a download that runs on your Promira Serial Platform unit , which has been already licensed with the SPI Active – Level 1 and SPI Active – Level 2 Applications. Once you have purchased a Promira Serial Platform unit, you'll be able to instantly download and add new applications as they become available. Learn more about SPI in the SPI Background article. The Promira Serial Platform comes complete with a royalty-free API so you can take full advantage of your licensed applications. Less time wasted. Developers do not have to share tools or go to the lab to debug simple problems. Higher productivity. Developers can identify and fix problems quickly and easily with less down-time. Shorter development cycles. Projects get done on time and on budget. By saving just a few hours of engineering time, the Promira Platform will have paid for itself. The Promira platform is completely field-upgradable. Total Phase is committed to improving the Promira platform and offering new applications to increase the versatility of our products for our customers. You will never have to worry about being out of step with the latest software features. As long as you maintain support on your software, you'll be able to download the latest eligible software and firmware upgrades. Can I Use the API Programs that I Wrote for the Aardvark I2C/SPI Host Adapter with the Promira Serial Platform?